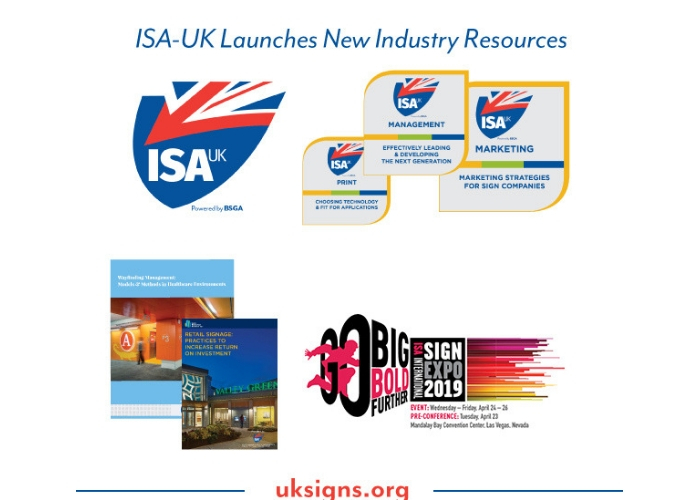 ISA-UK, powered by British Sign and Graphics Association, now provides members access to online training and research through the website, www.uksigns.org. These benefits come from the newly forged relationship between ISA and BSGA which took effect 1 January. Visitors to the website can access ISA’s online learning portal which provides 24 hour on-demand learning courses in six subject areas—all designed to strengthen job skills while saving time and money. Upon completion of an online learning course, participants receive a digital certificate showing proficiency. Digital badges are a portable, verifiable and secure way to showcase the skills and competencies learned. ISA-UK members also will have access to recorded webinars and co-branded research and white papers. The Sign Research Foundation reports and ISA white papers are designed to help sign and graphics businesses anticipate opportunities for expansion and learn best practices. Access to research, online learning and white papers is available under the Services tab of www.uksigns.org. ISA-UK members also receive free tradeshow admission and discounts to educational programmes at ISA International Sign Expo 2019, to be held in Las Vegas. The event will include more than 600 exhibitors showcasing the latest products for the sign, graphics and visual communications industry. ISA International Sign Expo 2019 will be held April 24-26, with a pre-conference on April 23. Learn more at www.signexpo.org/uk.